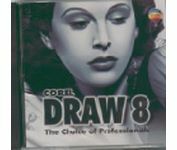 CorelDraw 8 has been created for the professional illustrator, graphic artist and desktop publisher, CorelDRAW™ 8 makes optimum performance its top priority. With interactive tools and utilities, plus Corel PHOTO-PAINT™ 8 for photo editing and bitmap creation, and CorelDREAM 3D 8 for 3D modeling and rendering, CorelDRAW 8 is all you need to explore your creativity. CorelDRAW™ 8 is a complete suite of powerful graphics applications and supporting utilities. CorelDRAW™ 8 is a powerful and intuitive vector illustration and page layout application that provides a full range of drawing, editing and text tools. Corel PHOTO-PAINT™ 8Create stunning designs and special effects easily with Corel PHOTO-PAINT™ 8, a powerful and fully customizable paint and photo-editing tool. CorelDREAM 3D 8 provides comprehensive tools for 3D object modeling, texture mapping, light control and high-resolution rendering. 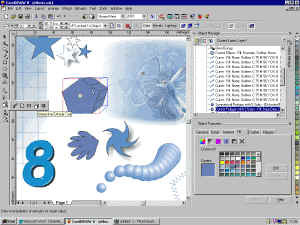 CorelDRAW 8 - Award winning illustration and page layout software. Corel Photopaint - Comprehensive photo-retouching and photo-editing program. Corel Dream 3D - A Spline-Based modelling and rendering application. Kodak Digital Science™ Colour Management System – ensures accurate color representation during scanning, display and printing using ColorSync® 2.0-compatible device profiles. Kodak is also offering Corel users a discount on the purchase of Kodak Scanner Profile Target Packs. Bitstream® Font Navigator™ 3.0 – a font manager for Windows® 95 and Windows NT® 4.0 developed by Bitstream, gives you a quick and easy way to find, install and organize fonts into manageable groups and to view and print font samples. Corel adds PDF support in Corel Draw 8 and other new features include node editing, keyboard shortcuts, new menu look and feel, Corel Tutor, customize your tool set. Note: Upgrade eligibility excludes academic, OEM and Not For Resale (NFR) versions. Corel products not listed above are not eligible for the upgrade version. Please Email or Call 0844 808 3699 to enquire about site licenses, network versions, bulk discounts or educational pricing. Use you back button to return to this page after viewing the screenshots. See our full Postage & Delivery Details including shipping rates within the UK, Europe and worldwide, first class and next day before 9 AM and 12 Noon, same day options. Check Exchange Rates to convert UK pricing or Email us with your country and/or currency for a quote. Any questions prior to ordering? - then email: Sales or call us on 0844 808 3699, otherwise proceed to the Order Form. Now hit Ctrl+C to copy the selected text to your clipboard and then paste (Ctrl+V) it into your preferred Email program or click here to launch your Email editor. Click here for full Contact Details including postal address, additional phone lines and technical support email. Whilst we are based in Norwich, Norfolk in the UK we can ship most items internationally.